Soft and moist Muffins made with fresh apricots. These are made without egg and butter. Pre heat the oven to 350 F / 180 C / 160 Fan / Gas Mark 4. Prepare the muffin pan by greasing and flouring it and keep it ready. In bowl, sift together all purpose flour, baking powder, baking soda and salt. In another bowl, mix yogurt and sugar well. Then add milk, oil and vanilla extract to it and mix well. Add this yogurt mixture little by little to flour mixture and mix well till a smooth batter is formed. Now add the chopped apricots to the batter and mix well such that they are evenly distributed in the batter. Now add the batter in the prepared muffin pan such that each cup is about 3/4 th full. Bake for about 15 - 20 minutes till the tooth pick inserted comes out clean. Let it cool slightly then remove from the muffin pan and then let it cool completely and then serve. To get 1/2 cup of chopped apricots I used 2 apricots. But this depends on their size. I washed them, removed the seeds and then chopped them into bite sized pieces and used. Make sure all the ingredients are in room temperature. Baking time varies with each oven. Check yours accordingly. These muffins took 18 minutes in my oven. 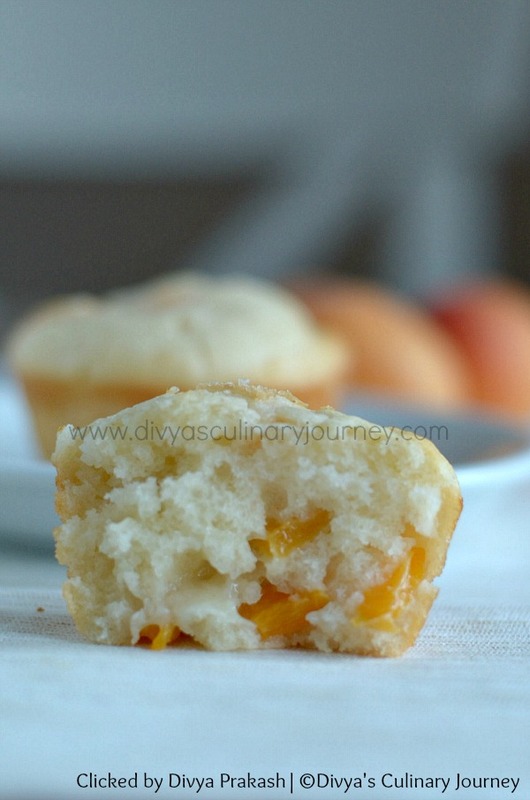 Muffins looks so pretty and those apricot chunks makes this muffins more appealing. 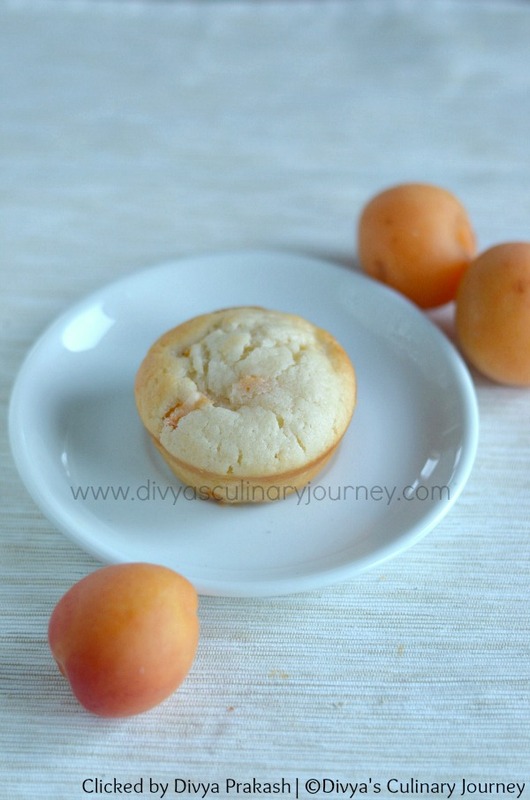 Apricots in muffins sounds awesome.Looks so soft and yummy. These look so good and I love the chunks of apricot. 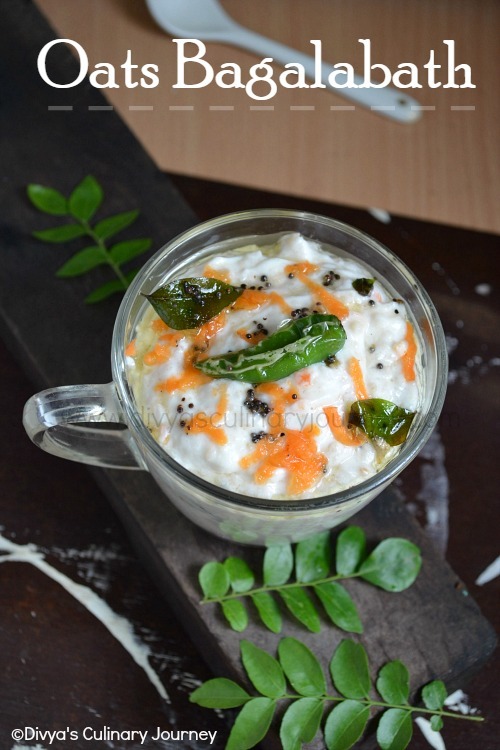 Great recipe Divya. Like the eggless recipes. We're loving the apricot in these beautiful and delicious looking muffins; what a great way to start the day! Thanks so much for sharing. These do look so soft and numny! I love the apricot flavor in them. Nice recipe! Mmmm so light & fluffy - what a delicious treat! These look really good! And, I know a couple people who are allergic to eggs, so this will work for them. thanks! 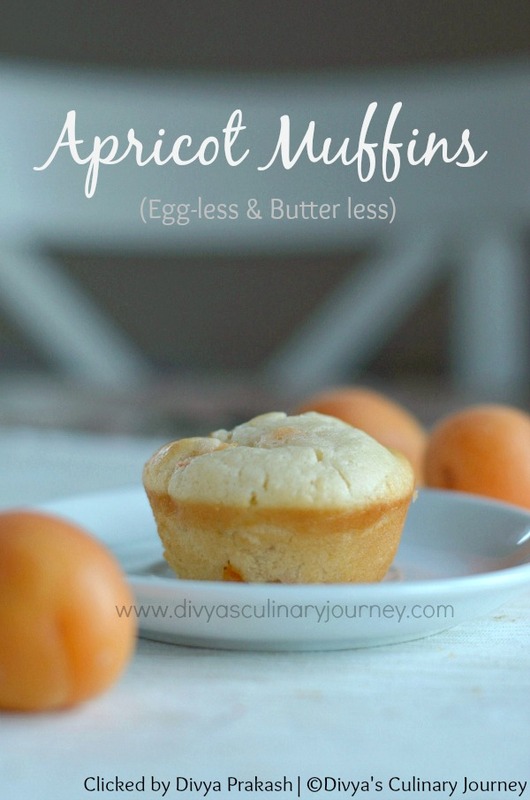 As I love everything "apricot," I know your pretty muffins are definitely on my must-try list! Thank you for sharing! I don't think I've ever worked with fresh apricots, but this recipe makes me want to. Love that it's eggless! These muffins sound like a yummy way to start the day. Love the Chopped apricots in them. i love baking with yogurt—these look so light and delicious! Certainly a delicious way to use apricots and love that even those with egg allergies can enjoy them, too! These muffins look perfect for snacking and at breakfast! I love apricots and can't wait for summer to enjoy them again. Your muffins have a flair of summer and I love them! Oh, how fun, love apricots, never had them in muffins though. Great idea!! Love the idea of addig fresh fruit to muffins. I haven't used apricots in baking and this sounds like a yummy recipe to try. Good looking muffins. Love the idea of adding apricots. Beautiful pictures and the muffins are topper!..nice doing this bakeathon with you!